Welcome to Mega Yacht Rentals Europe. Here you can find it all - culture, history, beauty, cuisine, peaceful bays, secluded islands, fantastic ports and nightlife. Mediterranean destinations have so much to offer in relaxed atmosphere. Italy offers world class charter destinations including Sicily, Porto Cervo, Sardinia, Naples, Portofino & the Italian Riviera, Capri, Positano, Rome and the Amalfi Coast. 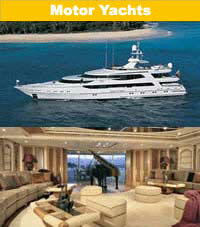 We have hundreds of boats and yachts throughout Italy for you - from Super Yachts to bareboats, to day charters. So please sort through our boats and let us know which ones are of interest, and we`ll take it from there! Our most popular destinations are Ibiza and Palma, both with plenty of sail and motor yachts and great charter itineraries. Whether for a bareboat or crewed charter, these islands offer everything from secluded coves with beautiful sunsets to renowned nightlife. Charters from the Costa del Sol can cruise the entire South Eastern coast of Spain and also reach exotic destinations such as Gibraltar and Morocco. Super Yachts are floating palaces, most with no expense spared. Today's Megayachts offer high speed Internet connections, Plasma Screen TV with satellite and a massive library of films, superb chefs that cook to your exact specifications, all the water "toys" such as water skiing, jet skis, scuba gear, and wind surfers. The interior is often created by name designers, and offer rooms for every need - offices, kids rooms (with Nanny's quarters, of course), glorious master suites, separate decks for sunning, hot tubbing, and dining, and lavishly appointed salons and dining rooms. Crew members often outnumber guests and offer unending hospitality. Some Super Yachts even have their own beauticians, masseuses and dive instructors. 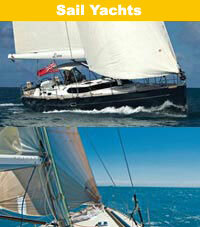 There are two general types of Sailboat charter - Bareboat and Crewed. A bareboat charter is where you take possession of the boat and sail it yourself, similar to renting a car. You must be an experienced sailor and generally must have a sailing certificate for this type of charter - you plot your course, raise the sails, deal with the vagaries of weather, drop anchor and moor. It's exciting and exhilarating, but responsiblity comes along with it. Ask for more information on Bareboat Chartering. If you like the idea of a bareboat charter, but would like help with the sailing, you can normally hire a skipper who will sail the boat for you and provide valuable information about the charter area. Just look for the bareboat you desire, and let us know you would like a skipper and we'll arrange one for you.